The Five Fundamental Substances: The substances that give rise to and maintain life. They are: Qi (vital life energy), Xue (Blood), Jinye (Body Fluids), Jing (Essence), and Shen (Spirit). Zang-fu: A set of 5 pairs of yin-yang organs that produce the Five Fundamental Substances. Jing-luo (meridians): The channels that connect the Zang-fu organs and regulate the flow of the fundamental substances throughout the body. So far, we have explained the fundamental substances and Zang-fu organs in great detail, but we have yet to discuss the importance of the Jing-luo. The Jing-luo or meridian points are of extreme importance in Traditional Chinese Medicine and serve as the cornerstone for understanding how the healing modalities in Oriental Medicine operate, such as acupuncture and tui-na massage. In this article, we will discuss the Jing-luo and their importance in TCM. In Traditional Chinese Medicine, a meridian or Jing lou is a channel through which qi and the other fundamental substances flow. 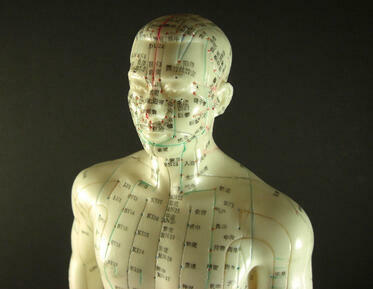 They are known by many different names, such as acupuncture meridians, acupoints, and energy vessels. 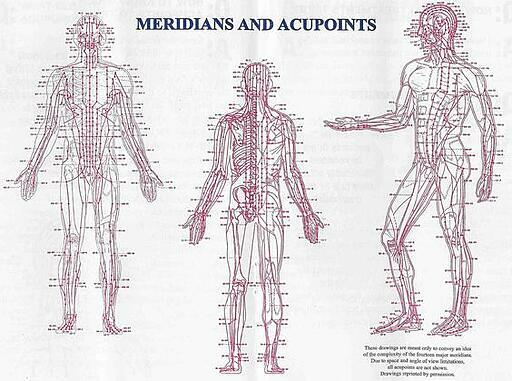 The meridians function as a network, much like a highway system, that can be mapped out throughout the entire body. They are similar to the circulatory system in western medicine, but it needs to be emphasized that meridians are non-physical. 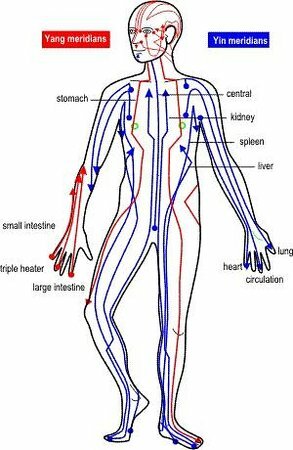 If you have ever seen an acupuncture model and have wondered what the several points or dots on the body are, they are the location points for specific meridians. Fully understanding the vast system of meridian networks and their functions, is a complicated subject that takes years of study at an acupuncture program and is beyond the scope of this blog. For the sake of simplicity, we will divide the Jing Luo network into two major categories: the jingmai or main meridian channels and the luomai or collateral vessels. What are the Jingmai in Acupuncture and Oriental Medicine (AOM)? 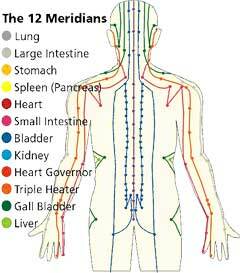 Twelve Major or Primary Meridians- These are the most important meridians of the body. They connect to the Zang-fu organs and are the main pathways that transport qi and xue (blood) throughout the body. Eight Extraordinary Vessels-Their primary function is to connect the twelve primary meridians. Twelve Divergent or Distinct Meridians-These meridians are responsible for connecting the wei (defensive) and yuan (parental) qi. 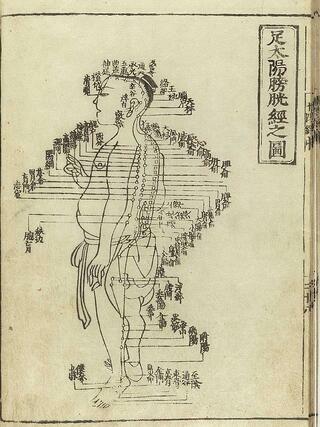 Acupuncture Print circa 100 BC. This shows the different Jingmai points. Fifteen Connecting Collaterals-Connect the interior and exterior meridians together. Muscular Collaterals-Distribute the qi of the twelve major meridians to the tendons, muscles, and joints. Superficial Collaterals-The collaterals on the superficial areas of the body, where functions of the major meridians manifest themselves. This chart demonstrates the complexity of labeling and understanding the different meridian points. In total, there are over 400 jingmai, the majority of which run along the Twelve Primary Meridians. 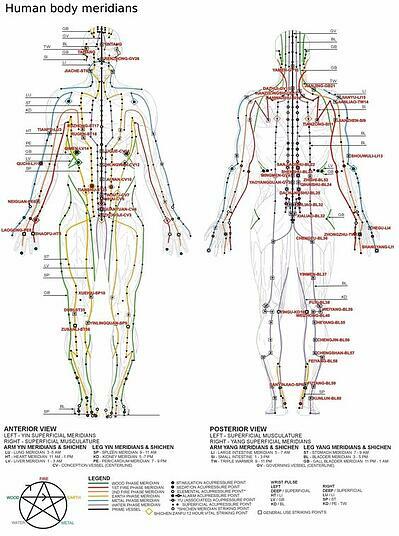 Because the Twelve Major Meridians are of great importance, it is important to discuss them in greater detail. The Twelve Major Meridians are the primary meridians through which qi flows. They are located in each arm and leg, have yin-yang properties, and are connected to a specific Zang-fu organ. There are six yin meridians that are located in the inner region of the arms, legs, chest, and torso. 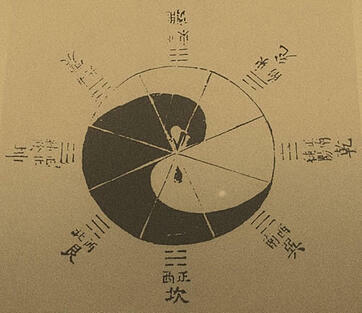 The six yang meridians are located on the outer region of the arms, legs, head, and torso. In total, there are three yin meridians (heart, lung, and pericardium) and three yang meridians (small intestine, large intestine, and sanjiao) of the arm, as well as three yin meridians (liver, kidney, spleen) and three yang meridians (urinary bladder, gall bladder, and stomach) of the leg. This collection of three yin and three yang patterns is referred to as Six Meridian Theory. The theory describes the type of yin-yang qi and degree to which sunlight is received, which is based on its position on the body, from most external to most internal. Tai Yang- Greater yang. Most external. Posterior position. Yang Ming-Brightness yang. Anterior position. Shao Yang-Lesser yang. Posterior position. Tai Yin-Greater yin. Anterior position. Where lung and spleen qi interact. Shao Yin-Lesser yin. Posterior position. Where heart and kidney qi interact. Jue Yin-Absolute yin. Most internal. Lateral or middle position. Where liver and pericardium qi interact. Meridian Time Flow: This special arrangement of the Twelve Major Meridians allows for the body to function in a clock-like manner. The qi in the meridians flow according to a kind of circadian cycle, based on the time of day. 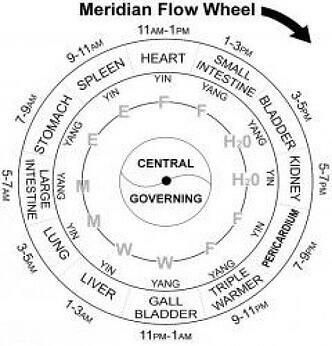 Because of the connection between the meridian and the Zang-fu, this cycle can be used to pinpoint and treat illnesses. Like with all yin-yang pairs, each of the Twelve Main Meridians exists as a connecting pair that establishes an internal-external relationship with the Zang and fu organs. Each arm meridian has a leg meridian counterpart. These meridians also affect each other’s Zang-fu pairing. For example, illness of the heart or its meridian is treated through healing via the meridian points of the kidney. The Twelve Major Meridians exists as a yin-yang pair. Meridians and Acupuncture: The knowledge of the relationship between the meridians and Zang-fu sets the basis for understanding how the different healing modalities in Traditional Chinese Medicine function. This is especially true of acupuncture, which focuses on restoring the proper flow of qi in the meridians using needles. 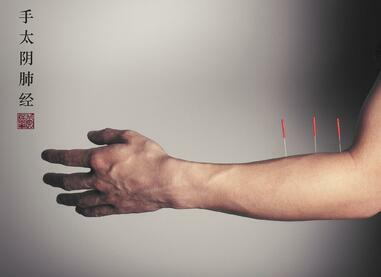 In the next article, we will discuss in greater detail how acupuncture functions. If you are enjoying this blog series on the philosophy of Traditional Chinese Medicine, then you should consider a career in acupuncture, which was recently approved by the American College of Physicians. To learn more, download our career guide below. Acupuncture and Massage College is located in the Kendall-area of Miami-Dade County in Florida. For more information, write to our admissions director at admissions@amcollege.edu. Visit us near the Kendall Mall at 10506 N Kendall Dr, Miami, FL 33176 or give us a call at (305) 595-9500.